Below are all of the parameter choices for the Easy Chart Builder plugin. Description: comma-separated list of the items being compared. In this example case, three versions of Windows. Description: comma-separated RGB colors, one for each item listed in groupnames. A set of default colors are provided if you do not specify any. Description: comma-separated list of tests / comparisons we are reporting on. In the example provided, a list of performance measurements for our operating systems. Description: Comma-separated list of values for a particular group. If X=1 (group1values), the values are associated with the first entry in groupnames (in this example, “XP”). The contents of group1values are then the measurements for XP from the tests described in valuenames (disk copy, network speed, etc). Up to 12 groups can be specified (i.e. up to group12values). Description: Comma-separated list of indices into the corresponding groupXvalues list where you want data points emphasised. The feature places a visual marker rendered on the chart at each specified point for the group. Fractions can be used to place the marker between data points (for example, 2.5 to place a marker between your third and fourth value). Remember that indices are 0-based, so 0 is your first value. For a particular group. If X=1 (group1markers), the values are associated with the first entry in groupnames (in this example, “XP”). The contents of group1values are then the measurements for XP from the tests described in valuenames (disk copy, network speed, etc). Up to 12 groups can be specified (i.e. up to group12markers). Description: A color code for markers. The default is FFFF00 (yellow). Description: Defines the lower bound axis. Values below this are clipped (not plotted). This can be used to zoom into the interesting area of a bar or line graph. The default is to not define a minimum axis value. Description: Create a band of color behind the chart over a particular range of values. It is to create an emphasis of some sort for your discussion on the data being presented. Description: A color code for the watermark region. Description: A currency representation for the chart table values. The default is to not have one. Right now only the chart table will show this. Description: Number of decimal places to represent values. For example, a dollar amount may want 2 decimal places such as 9.00. This feature is not limited to currency of course. Right now only the chart table will pay attention to this setting. The default is to not have a precision restriction. Description: alternate text for chart image. Allows you to fill in the ALT attribute of the chart image. It can help you with SEO rankings. If left blank, the title parameter is used to fill it. 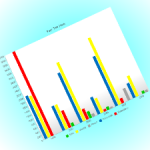 Description: Allows you to assign the TITLE attribute for the chart image. Description*: If set to “true” the chart data table and show/hide button are not built. Description: An alternate class (or set of classes) to use for the data value table. This will help theme your table. Description: The CSS Style tag attribute for the image. Description: Turn a background grid on or off.